Have you ever wished that you could download all of those great videos that you see on Google? Now you can! Google/YouTube Video Downloader enables you to download any Google/YouTube video straight to their hard disk. The program is extremely simple to use. Just browse internet video with standard IE browser, and the program will start downloading the movie and converting it to your desired format automatically. 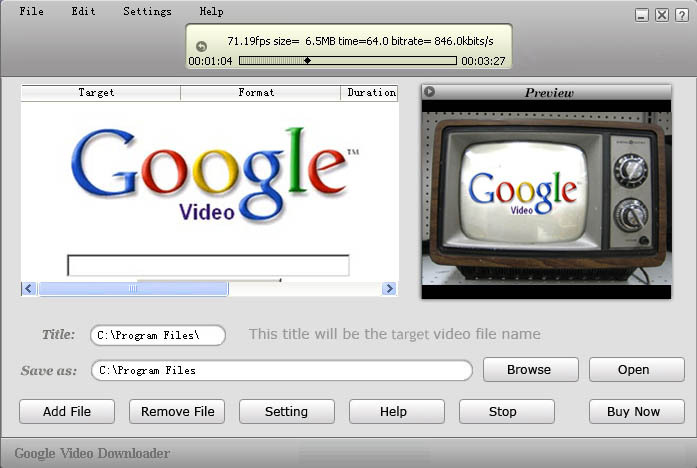 A free Google Video Downloader and Myspace video Saver. Qweas is providing links to Google Video Downloader 2008.3.1.0423 as a courtesy, and makes no representations regarding Google Video Downloader or any other applications or any information related thereto. Any questions, complaints or claims regarding this application Google Video Downloader 2008.3.1.0423 must be directed to the appropriate software vendor. You may click the publisher link of Google Video Downloader on the top of this page to get more details about the vendor.